Standing cup and cover; body and cover formed of ostrich egg-shell mounted in silver, chased in bold relief and gilded; body held by three vertical bands, each chased with cupid mask, terminal figures and scrollwork; lip engraved with three medallions containing busts with elaborate scrolls between; horizontal mount at top chased with strapwork frames containing lion masks, fruit, etc. ; foot similar; baluster stem with masks, interlacing scrolls and terminal monsters; cover: engraved scroll border with three lion masks; centre: female figure holding disc in one hand and two shields in other, one with hare springing from three mounts, saltire and monogram on other; inside cover a medallion with figure of Justice with sword and scales. This object was previously owned by Charles Edmund Law and Edward Law, and collected and bequeathed to the British Museum by Ferdinand Anselm Rothschild. Origin: German; no silver punch-marks; probably Nuremberg, third quarter of 16th century, with later alterations and additions. Marks: No punch-marks have been struck on any part of this piece. Provenance: In Read 1902, it is stated to have come “from the Ellenborough Collection”; however, it has yet to be established that Baron Ferdinand Rothschild made this acquisition as a result of a private negotiation with Charles Edmund Law, who was created Baron Ellenborough in 1871, after he had succeeded his uncle, Edward Law. The latter, having been Governor-General of India from 1841 to 1844, was created Earl of Ellenborough in 1844 and then First Lord of the Admiralty in 1846. 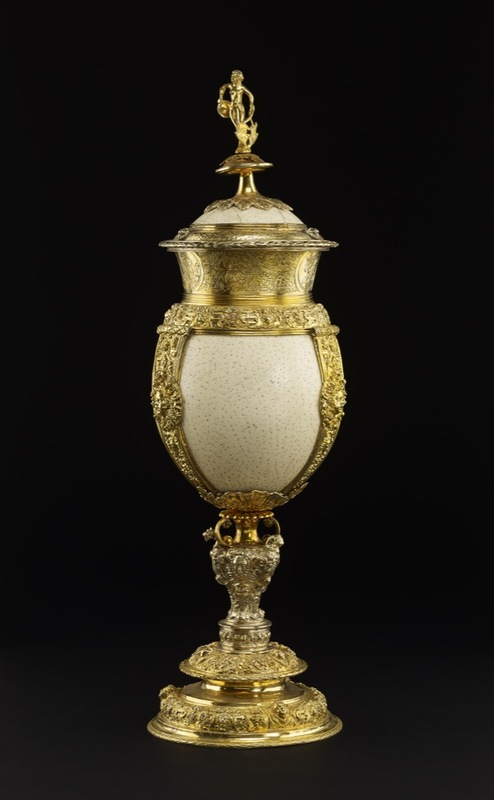 This ostrich-egg cup may, therefore, have belonged to both the Earl and his nephew. The latter died at his home, 6 Buckingham Gate, Hyde Park, in 1890 aged seventy, and, although there was an auction sale of his collection at Christie's on 28 May 1895, there is no mention of this ostrich-egg cup in the sale catalogue. Commentary: In the absence of any marks, this standing-cup and cover has hitherto been published as “German, 1554”. However, in the light of its heavily altered appearance a re-examination of the evidence for such an early dating is essential. It appears to rest solely on the presence of the engraved date, 1554 (within the field of the roundel depicting a crowned bearded king); unfortunately, the engraving of the date is particularly gauche and gives the impression of having been added at a later date, presumably in the mid-nineteenth century. In particular the '4', which could not be accommodated with the rest of the date (on the left of the roundel), has been most incompetently engraved, being not only out of scale but also overlapping both the inner frame and the edge of the beard. Since the authenticity of the engraved numerals 1554 cannot be established, the cast reliefs on the base and on the strap-mounts provide the only reliable evidence for the dating of the original cup. Fortunately, the circular relief on the upper tier of the base is identical to the securely documented version in lead that has long been associated with the workshop of Wenzel Jamnitzer (1508-85), the famous goldsmith of Nuremberg. Although the lead version has been frequently discussed and illustrated in the literature on Jamnitzer since M. Rosenberg, ‘Jamnitzer, Alle erhaltenen Goldschmiedearbeiten. Verlorene Werke. Handzeichungen’, Frankfurt, 1920, none of the authors had realised that a version in silver existed in the Waddesdon Bequest and that it forms the upper stage of the base of this ostrich-egg cup. The lead version in Basle has been preserved since before the end of the sixteenth century in the historic Amerbach Cabinet, one of the greatest humanist private collections of the Renaissance to be created north of the Alps (see I. Weber, ‘Deutsche, Niederländische und Französische Renaissanceplaketten 1500-1650’, Munich, 1975, p. 156, no. 257, pl. 72; also ‘Kabinettstücke der Amerbach’, Historisches Museum, Basle, 1984). Basilius Amerbach (died 1591) is known to have added significantly to the already remarkable family collection which he had inherited in 1562, and would most probably have been responsible for acquiring the few Jamnitzer lead reliefs that are today preserved in the Amerbach Cabinet. This particular relief has already been published as a “mid-16th century model for a foot” (Weber 1975, p. 156, no. 257, pl. 72, where reference is also made to the publication of a similar relief on the cover of the famous Augsburg silver-gilt water jug, formerly in the Ambras Collection (before 1596) and now in the Kunsthistorisches Museum, Vienna, in E. Kris, ‘Golschmeidearbeiten des Mittelalters, der Renaissance und des Barock. I Teil: Arbeiten in Gold und Silber’, Publikationen aus den Kunsthistorischen Summlungen in Wien, Band 5, Vienna, 1932, pp. 37-8, no. 55, pls 18 and 82). The lead relief in Basle has been discussed in relation to the Jamnitzer sketchbook in the Berlin Kunstbibliothek (in Klaus Pechstein, ‘Goldschmiedewerke der Renaissance: Kataloge des Kunstgewerbemuseums Berlin, Band V’, Berlin, 1971, p. 254, fig. 1) but it has never before been found - or considered - in association with the 'pilaster-like' relief decorating each of the three vertical strap-mounts of this ostrich-egg cup in the Waddesdon Bequest. Collection in the Cologne Kunstgewerbe Museum (see Weber 1975, p. 283, no. 642, pl. 173, where the relief has been attributed to a German workshop, perhaps in the North-west, in the third quarter of the sixteenth century). Indeed, the style of the relief decoration is not dissimilar in general character to that used as a frieze around the drum-shaped bowls of the Tucher covered cups of 1568 by the Nuremberg goldsmith Christoph Lindenberger, who became a master in 1546 and died in 1586 (see Hugh Tait, ‘Catalogue of the Waddesdon Bequest in the British Museum: Vol. II. The Silver Plate’, London, 1988, pp. 111-21, nos 14-15, figs 105-6). However, the superimposing of a cartouche with a large putto head is an ingenious piece of adaptation which once again seems characteristic both of mid-sixteenth-century Nuremberg workshop practice and of the sculptural style favoured by the leading goldsmiths in that city at that time. It can be compared with the slightly different solution being favoured by the contemporary goldsmiths in Augsburg, especially Theophil Glaubich (died 1572), who worked for the Archduke Ferdinand of Tyrol, the Emperor Maximilian II and the Munich Court. His very similar type of applied cartouche - but enclosing a female head - can be seen on his tall double-cup (H. 46.5 cm) preserved in the Moscow Kremlin (see Tait 1988, p. 158, fig. 151; also H. Seling, ‘Die Kunst de Augsburger Goldschmiede 1529-1868’ 3 vols., Munich, 1980, p. 247, fig. 129, where it is dated “um 1565-1570”). Despite the differences, both the Nuremberg and Augsburg versions were at their most fashionable soon after the middle of the century. On the evidence of the reliefs (both on the base and on the strap-mounts), the engraved date of 1554 therefore cannot be faulted, although it would seem to be about as early a date for this type of decoration as could be expected in a German centre. Indeed, only by the third quarter of the century were the craftsmen in the major centres of Southern Germany beginning to produce those innumerable variations on that basic decorative scheme, which has been used so successfully by the engraver of the rim of the bowl of this cup. The combination of busts in roundels between panels of differing patterns of foliate interlace and strapwork arabesques - made readily available through the published books of engraved designs of the 1550s - was found to be particularly suitable for decorating the borders of dishes and plates - and, of course, the broad rim-mounts of bowls, such as on this ostrich-egg cup. In conclusion, the absence of all marks from a German mounted cup of the third quarter of the sixteenth century is not unexpected, even in a leading centre like Nuremberg. Consequently, an attribution of these very important mounts - excluding the stem and the cover - to Wenzel Jamnitzer's workshop or to a Nuremberg goldsmith working within the sphere of Jamnitzer's influence seems fully justified. Hugh Tait, 'Catalogue of the Waddesdon Bequest in the British Museum. II. The Curiosities', British Museum, London, 1991, no.4, figs. 35-45. Rare English ostrich egg cup, marked for John Spilman, London 1590, who was a foreign goldsmith working in London and was knighted by James I in 1605. For this cup see Christies London 25 November lot 55, The Whitfield Cup.Associated dates : 1554. Compare strapwork with lip of salt on Calvary Salt Cellar dated 1550 in Schroder Collection, Schroder 2007, no. 54, made in Nuremberg in Jamnitzer circle.